A late C11 cruciform church with a fine chancel arch. Most windows appear to be C13, though not entirely straightforward, and in the C14 the south porticus was converted into a tower. 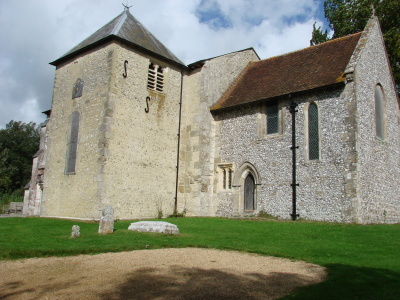 Among the many fine C11 churches in Sussex, Stoughton has been curiously overlooked. 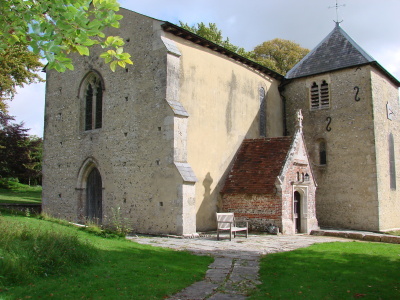 There is good stylistic reason to assume that it is the one mentioned in Domesday Book (11, 37), built on a cruciform plan with lower transepts or more properly porticus. One reason for the lack of attention may be the unattractive cement render, which until recently covered all the outside except the chancel and is still to be found on the nave side walls. The relatively tall nave has walls 2ft 5in thick, though it is proportionately quite broad. Both north and south doorways are later (the south one has a renewed segmental head), but the tall rere-arch of the north one may go back to the C11. The massive quoins are exposed and so, on the north side, is some re-used Roman brick. The round-headed lancets each side, set high, led the VCH (4 p125) to date the nave to the C13, but they are probably enlarged from C11 windows. The porticus are as usual slightly west of the chancel, so there is no proper crossing. The south one was later turned into a tower and both have double-splayed west windows. The removal of the render has revealed that the lower part of the tower, like the west wall of the nave, contains herringbone masonry. Whilst not necessarily indicating a pre-Conquest date, such work does normally date from the C11. 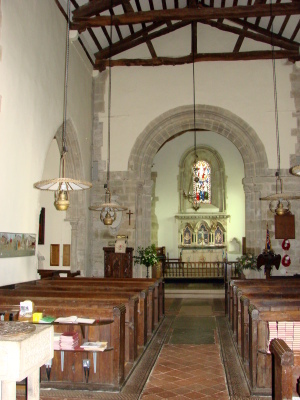 The chancel arch, though smaller and proportionately wider, recalls that at Bosham and as Earl Godwin held both places (SAC 87 (1948) p49), a link is probable. The arch at Bosham was long seen as pre-Conquest, but recent research dates it to c1070 at the earliest; a dating as late as c1100 (www.crsbi.ac.uk retrieved on 22/4/2013) has been proposed for the arch at Stoughton, but the rest of the detail in the church supports a rather earlier date, though as Baldwin Brown first noted, the arch is certainly post-Conquest. 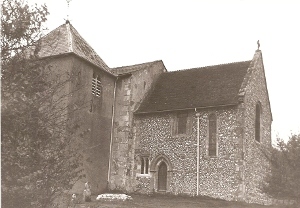 Unlike Bosham, there is no sign that any of the fabric is older, so everything probably dates from shortly after c1070, though John Potter (SAC 145 (2007) p90) postulates a church with a pre-Conquest plan that was extensively reconstructed after the Conquest, possibly as a consequence of fire-damage. There is no visible evidence for this and the inclination to ascribe any part of Stoughton to a pre-Comquest date is today less, given the later dating now preferred for much of the work at Bosham, for the similarities between the arches here and at Bosham are obvious. Both have two orders on the heads with heavy roll-mouldings, also on the soffit. The responds comprise three attached shafts with bases of three rings. 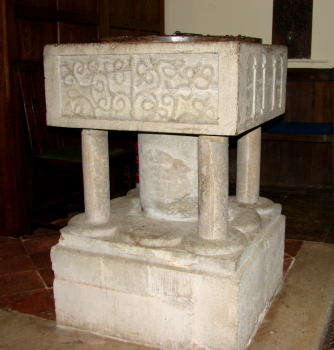 The volute-capitals look later than those at Bosham, though they are applied to the capitals awkwardly. The chancel has no C11 detail, but appears never to have been lengthened as the east quoins look C11, though there may have been an apse (ibid). The present detail dates from around 1200. That includes the east window, which though round-headed, is too big to be C11 and has a rere-arch with a moulded head and shafts with rings, which are noticeably angled. P M Johnston (WSRO Par 189/4/12) cited precedents in Ireland where this was deliberate, but such a feature is unknown in southern England and more probably results from errors in building. There is one large south east lancet which has a scoinson that points to a rather later date in the C13, and though renewed in the C19, the work was done accurately. Otherwise, the side windows are likely to be earlier than the lancet, but they are problematic. Their rere-arches are shafted like the east window, but the heads are cut off at the top of the walls. The position is like those in the nave, so they were probably also adapted from C11 ones. It has been suggested that the lack of heads were a further error by the builders (VCH 4 p124) or that the wall has been lowered. If the latter, it was done before 1805, when the Sharpe Collection drawing shows the south window was already in this state. Certainty is impossible but the most likely explanation is a blunder by the builders, even though the present height is appropriate relative to the nave. The nave and porticus were altered around 1200. The round-headed lancets that replaced the two side-windows have rere-arches without scoinsons. Of three doorways in the nave, the south and north ones (the latter now opens into a vestry) have a single chamfer and the west one two orders with abaci. Pointed arches from the nave into the porticus have heads of two orders, the outer ones chamfered and the inner ones with triple roll-mouldings. The square chamfered responds have attached shafts with palm leaves on the inner capitals. There are similarities with work at Chichester cathedral after 1187. Some roof timbers in the nave (though altered) and in the north porticus are probably of this date. In the C14 the south porticus was turned into a tower, and the newly revealed masonry shows a divide between the top and the C11 transept that now forms the base. The top displays smaller and more regular quoins and more carefully laid flintwork. No higher than the nave without the pyramid spire, the tower has trefoil-headed openings. A bell-frame was provided, built around four heavy braced posts. At Worth a rather similar arrangement, though with an upper stage entirely of timber, lasted until the C19 and probably one or more bells were housed in this position from the first. 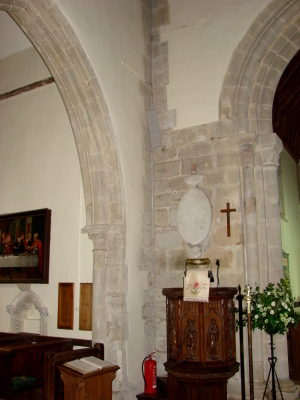 Close to the tower on the south side of the chancel is a C14 lowside, with two trefoil-headed lights under a square hoodmould with grotesque stops. The cusped Y-tracery of the west window is also C14. The Sharpe drawing shows a two-light square-headed east tower window, possibly C15, which is no longer there. The brick south porch is C17 though its segment-headed arch may be older and re-used. If the chancel walls were ever lowered, this is the most plausible time. 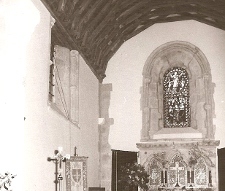 The nave roof was replaced with a low-pitched slated one, which incorporates some older timbers, probably around 1800. In 1844, J Butler (ICBS) removed the plaster ceiling from the chancel and may have done other work. There was more work in 1879 (Jessep p39), when the chancel roof was replaced – Butler’s plans show the old timbers had been left and made visible. Probably also in 1879, the reredos was designed by E Christian (BE p345) (see below) and it is possible that he undertook the whole restoration of that year, though it is not included in any contemporary list of his work. The flintwork of the chancel was not rendered before the recent work and it is probable that it was stripped at this time, though a less positive aspect of this is that it has been too thoroughly worked on to provide any clues to the date of the walling. Aumbry: (Chancel east wall, concealed by door) Early C13 square-headed. Altar rails: C17 with alternating turned and twisting balusters. Commandments etc: (In tower) Painted boards bearing the Creed, Commandments and Lord’s Prayer which are probably early C19. Font: Late C12 square shallow marble bowl with four round-headed arches on three sides. The elaborate scrollwork on the fourth may represent the tree of life. There are corner shafts and a thicker central stem. 1. (East window) J Hardman and Co, 1877 (Index). 2. (South transept, south window) J Hardman and Co, 1878 (ibid). 3. (West window) Clayton and Bell, 1927 (WSRO Fac 2978). 1. (Chancel east wall) Early C13 trefoil-headed, placed unusually close to the aumbry. 2. (North porticus) Trefoil-headed of around 1200 with dogtooth moulding and head-stops. There is an image-bracket over it. 3. (South porticus) Simpler trefoil-headed of the same date. It indicates that the south porticus was used as a chapel, at least until turned into a tower. Pulpit: C19, made of wood. Reredos: Triple and made of marble and mosaic, designed by E Christian (BE p345).